The Anglican–Old Catholic International Coordinating Council (AOCICC) met in the central European capital city of Prague, Czech Republic, from 16 to 19 January 2019. The meeting was hosted by the Union of Utrecht. This was the seventh and final meeting of the Council under its current mandate (2013–2019). formulating recommendations for the next mandate of the AOCICC. 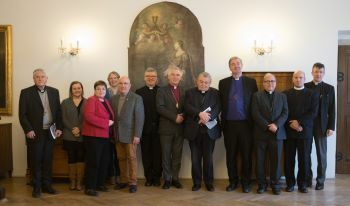 The Council was invited to a meeting with Cardinal Dominik Duka OP, Archbishop of Prague, and Auxiliary Bishop Václav Malý at the Archbishop’s palace. Members of the council appreciated the opportunity to learn from them about the challenges the Czech Churches faced throughout the 20th century and to the present day. Worshipping together has always been integral to the meetings of the Council. Alongside the Daily Office (celebrated alternatively according to the Anglican or Old Catholic tradition), the Council celebrated the Eucharist in the Old Catholic tradition at the Old Catholic Cathedral of St Lawrence in Prague, at the invitation of the Dean the Revd ThDr. Petr Jan Vinš. The Council thanks him, the bishop of the Old Catholic Church of the Czech Republic, the Rt Revd PhDr Pavel Benedikt Stránský, and the Bishop’s Office in Prague for organising and hosting the meeting. For further information, please contact the Revd Neil Vigers (neil.vigers@anglicancommunion.org) or the Revd Lars Simpson (lars.simpson@christkath-zuerich.ch).